YOU ARE A FREE MAN THE WORDS THAT AFTER 35 YEARS ARE LISTENING BY JAMES BAIN THAT RECOGNIZE AN ERROR OF THE UNITED STATES JUSTICE. Many times we can what is JUSTICE , in which is based JUSTICE to convict or not a person. * Action to consider claims by someone, agreeing what is fair. * Attribute of God, which rewards or punishes each person according to their deserts. With this we may also infer that it would be the attribute that the judiciary, and state power that has been created to regulate certain rules of conduct that have evolved over time in order to achieve a peaceful and harmonious coexistence, shares rewards or punishes people according to behave or act. * Revolutionary concept of justice is based on justice conceived as the human ability, based on ethical principles, moral and juridical pursues as its supreme goal to achieve the respect and proper exercise of individual or collective rights, for which purpose it must implement specific actions as coercion and / or sanction of human actions in the correct proportion, ie equating the value of the legally protected with the damage caused by the conduct or lack of it. And if you still looking for will be many more depending on the time, societies, culture and also the thinking of each of the people inhabiting this planet. What happens when the justice dispensed by the wrong man, is based on circumstantial facts, comments from other people, suspected of other people, not concepts, and scientific definition? 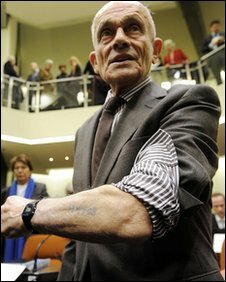 The trial of alleged Nazi war criminal John Demjanjuk, began in Munich, this Monday, 30 November 2009, is accused of complicity in the deaths of nearly 28,000 Jews in the Polish concentration camp of Sobibor, during the 2nd War World. 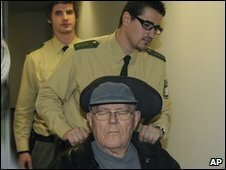 The accused against John Demjanjuk, is that he was one of the guards at Sobibor concentration camp. Also that his true identity is Ivan ” the Terrible”, one of the most wanted war criminals for all these years. John Demjanjuk, of Ukrainian origin, has lived the last years in the United States, where he was deported from in late May 2009, to Germany to face this trial as a suspected war criminal. Before the trial, was passed by a medical board to see if he was able to face this criminal process, due to their age and several medical conditions he has, the Medical Board ruled that he could face the process because even he is ill hes is mentally fine, although his presence in court is subject to 90 minute sessions to avoid draining. At the time of deportation, John Demjanjuk, was in the top 10 list of most war crimes suspects wanted by the Simon Wiesenthal Center. According to what we know, John Demjanjuk, was recruited by the Soviets in 1941, and after he was captured by Nazi forces he turned into security guard at the concentration camps of Nazi rule of the Third Reich, where he is remembered most is in the Polish camp of Sobibor, which states that introduced the power to men, women and children into the gas chambers. The charge imposed on John Demjanjuk is “complicity” in the deaths of nearly 28,000 jews in Sobibor concentration camp in 1943, also in the process Maybe will be possible to discover if it really is Ivan “the Terrible”. Sometimes tragic events are used by politicians to seek political mileage, I at least do not find meaning in it, not think about the pain of the families, friends, work colleagues, the lives that are lost. This has happened in Uruguay, during the political campaign, in the runoff, which will be held on 29 November between two opposing visions, from the right formula comprised of white party Luis Lacalle and Jorge Larranaga and in the other corner, representing the Broad Front, currently in power, with groups from the socialist left as the most ultra-left groups that shaped the urban guerrilla Tupamaros, with the formula for Jose “Pepe” Mujica y Danilo Astori. It happens in a house fire, that there would be nothing surprising, so the police sent a police man and a woman police to tell the landlord what had happened was right, had to give notice, but Here comes the tragedy, the police never imagining that the owner of that house accountant Saul Feldam , had much to hide, knocks on the door when they open the door and tells him what happened, the counter Feldman enters his house and fired from within against the police, who died while being taken to the police hospital. that entrenchment occurs counter Saul Feldman, who for hours against the police firing, the geo panel that when he felt that he was hurt Feldman entered to see him and Feldman was dead by the time the police are about geo group shoots and kills him. Towards the hours passed the day, with the hidden population to hurt them no bullet, police, geo group, military group attacked the house, throwing tear gas, which no one knew is that the morphine was injected Feldman which also allows you to put up with him suddenly heridasy also lose some of their mental capabilities at the time when injected continuously. Accountant Saul Feldman, was in terminal stage of cancer, so he did not have much to lose, his death was assured, so resisted until a police bullet or by his own hand, not yet have confirmation, conclude with his life. But the most amazing was when the police entered, they had never imagined what they would find an arsenal of weapons, some 600 weapons of various types from FAL, AK47 and pistols Glok, also propelled grenades and rockets, also grenades, handguns, explosives military kevlar vests and gas masks, which are presumed to be those used in the war on drug trafficking in the Brazilian favelas. Also found gold bullion, which is the way that drug traffickers pay the weapons are bought on the black market. BLACK SEPTEMBER ATTACKS THE 1972 MUNICH OLYMPIC VILLAGE HOSTAGE ISRAELI TEAM – 36 YEARS OF DESTROY OF THE FEELING OF THE OLYMPIC GAME. That slogan was broken by those who attacked this healthy spirit of competition, overcoming, harmony between countries, even friendly political or racial differences, a group of men with ideas that can not accept the difference of others attacked the spirit olimpico that Baron Pierre de Coubertin, the modern era brought back to ancient Greece. The Olympics have always meant joy, sport, party, friendship, meet thousands of nations coming together for a common purpose, to show the world the bonds of friendship, healthy competition, actually, where the sport, the color of the inauguration party, farewell, mark historic moments. But that September 5, 1972, all changes when a group of terrorist group “Black September” broke into the premises of the Olympic village in Munich, and taking hostage Israeli athletes. Eight members of Black September, climbing the six-foot fence surrounding the complex of the Villa Olimpica, wearing tracksuit and carrying guns and grenades in bags, invaded the apartments of the Israeli delegation was staying to take them hostage. The wrestling coach, Moshe Weinberger, hearing noises in the apartment door pounces on it trying to lock and giving the alarm, in moments of confusion 9 athletes were able to escape and 8 are hidden. The wrestler, Joseph Romano, who was returning from lunch were faced with one of the terrorists, and killed by a bullet, the wrestling coach, Moshe Weinberger, who try to attack one of the members of with a fruit knife, also was shot and killed after that the terrorists took hostage: David Berger, Ze’ev Friedman, Joseph Gottfreund, Eliezer Halfin, Andrei Schpitzer, Amitsur Shapira Kahat Shorr, Mark Slavin and Yaakov Springer. The Argentine-Israeli Mutual Association ( AMIA ) collapsed after a traffic van with explosive in a terrorist attack crash on their building. I still remember that day like it was today, my country, where I live, Uruguay, is in the west of Argentina, it’s the city of Cologne is only few kilometers from Buenos Aires. We have a saying that cross the river, we are in Argentina. It was a July 18, 1994, Uruguay was celebrated in the Declaration of the Constitution, and it was a holiday, not much to do, and the slogan was lifted late, turned on the television, I always like to start the whole day what happening in the world. It was 9:53 when the Argentine-Israeli Mutual Association ( AMIA ), was attacked by a car bomb, the news began to arrive in Montevideo, it was chaos from the city of Cologne came to see the smoke of the chaos that was happening then in the neighboring country. The first one was kept and brought, there was nothing safe, but soon the first images started arriving, I thought that the war in the Middle East, was at the door of my home, looked like the Lebanon, Beirut, were not things that happened in Latin America, spoke of a car bomb, a terrorist attack carried out by Hezbollah, which could happen other bombs and the danger involved. The embassy, schools, Jewish institutions throughout Latin America began to close, appeared the police cordons were I knew that I could escape the intellectual authors of the Uruguayan border, so here also began to create chaos. And began to appear early survivors, bloodied faces, people with their members amputees, mothers screaming for their children, children by their parents screaming, children crying, people were hugging and shared their pain, tears, silence, pain, rage, the lust for revenge. All in all, thousands of feelings, many questions and most importantly, WHY? WHY AN ATTACK ON THIS INSTITUTION THAT YOU GIVE TO ERA CLOTHING, FOOD, EDUCATION, HELPING PEOPLE AND RESOURCES AT Israelites from Argentine institutions also support? Why an attack in a charity institution? The former Nazi John Demjanjuk has been considered by the Ficalia of Munich as suitable to be put on trial. The former mechanic of Ukrainian nationality, was deported from the United States where he lived, after several attempts to be brought to trial during the end of the Second World War. John Demjanjuk is accused of being a former guard at the Sobibor concentration camp, and be responsible for the deaths of at least 29,000 Jews. At present John Demjanjuk is 89 years and is sick and I use this often to avoid grounds for deportation until the day May 11 of this year, he was transferred to Germany after a court in Germany, I believe that only the United States and their judicial process to decide whether John Demjanjuk could be deported because there was no impediment to doing so. Having come to Germany, he began studying for a medical team to confirm whether it was suitable to support and understand what the meaning of the trial and the day July 3, the Prosecution of Munich gave its verdict, confirming that John Demjanjuk, is suitable to face the penal trial against him, in which he is charged with the deaths of 29,000 Jews at the Sobibor concentration camp. Anyway the hearings shall not last more than two daily sessions of 90 minutes each one. In addition to John Demjanjuk is accused of being Ivan the Terrible, one of the worst keepers of the Nazi era. Already in the past John Demjanjuk had been brought to trial even in Israel,at the begining he was condened to death but he was not able to purchase the facts as he was Ivan The Terrible so the death penalty was rejected by a higher court of Israel. Now turn to Germany for its trial, we know that if found guilty because of his advanced age would not meet the punishment did not last long and fulfilling, but more importantly in this case is the international recognition and condemnation of their crimes. And peace to those who were victims or their descendants of their victims to find inner peace that justice came to an end.